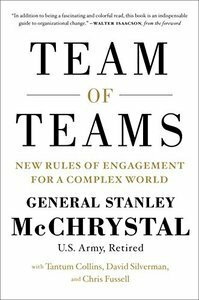 General Stanley McChrystal, Tantum Collins, David Silverman, "Team of Teams: New Rules of Engagement for a Complex World"
It’s no secret that in any field, small teams have many advantages—they can respond quickly, communicate freely, and make decisions without layers of bureaucracy. But organizations taking on really big challenges can’t fit in a garage. They need management practices that can scale to thousands of people. General McChrystal led a hierarchical, highly disciplined machine of thousands of men and women. But to defeat Al Qaeda in Iraq, his Task Force would have to acquire the enemy’s speed and flexibility. Was there a way to combine the power of the world’s mightiest military with the agility of the world’s most fearsome terrorist network? If so, could the same principles apply in civilian organizations? McChrystal and his colleagues discarded a century of conventional wisdom and remade the Task Force, in the midst of a grueling war, into something new: a network that combined extremely transparent communication with decentralized decision-making authority. The walls between silos were torn down. Leaders looked at the best practices of the smallest units and found ways to extend them to thousands of people on three continents, using technology to establish a oneness that would have been impossible even a decade earlier. The Task Force became a “team of teams”—faster, flatter, more flexible—and beat back Al Qaeda.